I remember I first started playing around with Photoshop when I was in high school. We had Photoshop CS2 on our ancient PC running Windows XP. 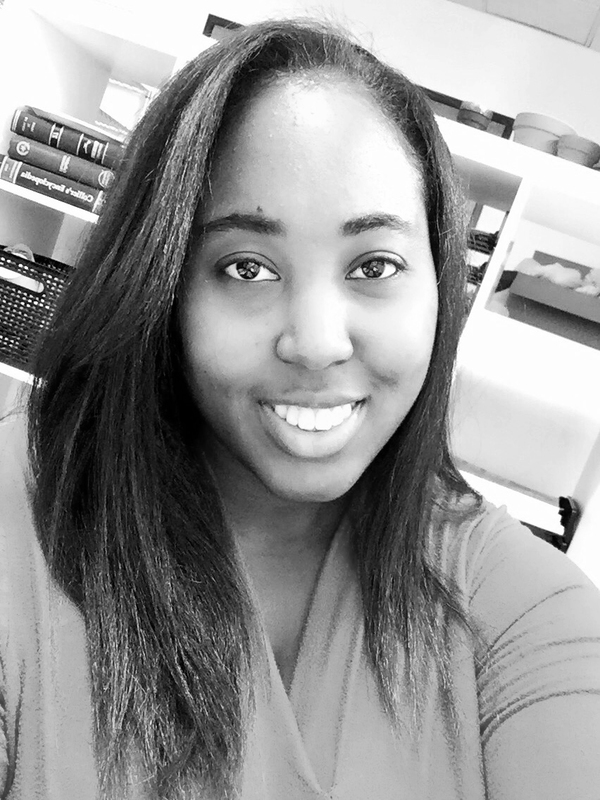 I was so excited when I discovered the "band aid" tool (which is what I called it back then), also known as the healing brush. I was amazed that my pimple disappeared with just a click of the mouse. As time went by and I learned more about retouching photos, I did what a lot of people probably do. Clone stamp a clean part of skin over a blemish and texture. It did clean it up, but it also copied the color and texture, which never usually matched up. It resulted in blotchy looking skin and obviously photoshopped. It definitely looked like an amateur did it. 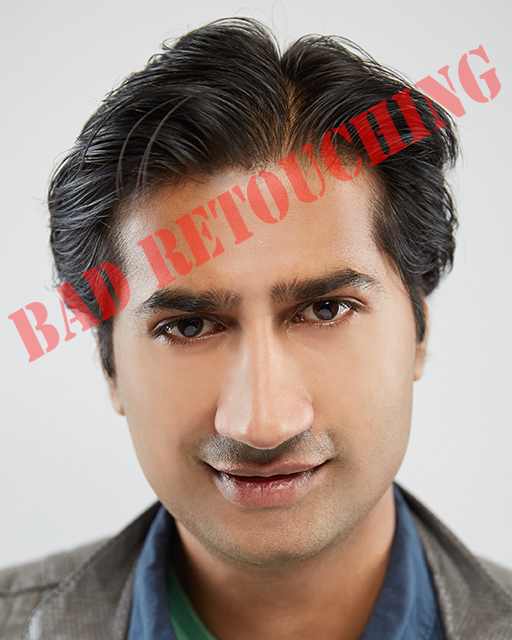 Here's an example of bad retouching. I eventually learned the correct way to retouch a photo and remove any flaws but with maintaining the original texture and keep it looking realistic. I'll show you how to do the frequency separation technique that will make you a better retoucher in no time. The frequency separation technique is the act of separating a photo into two parts. A high frequency image and a low frequency image. The high frequency layer is basically all of the photo's texture and the low frequency is just the color. Retouching this way allows you to do your clone stamping and healing on the high frequency layer to remove blemishes but you don't affect the color at all. There is a long process of creating the separate frequencies but there is an easy action you can download at the bottom of the page and it will do all the work for you in 2 seconds. Here is a step-by-step guide on how to use the frequency separation action. 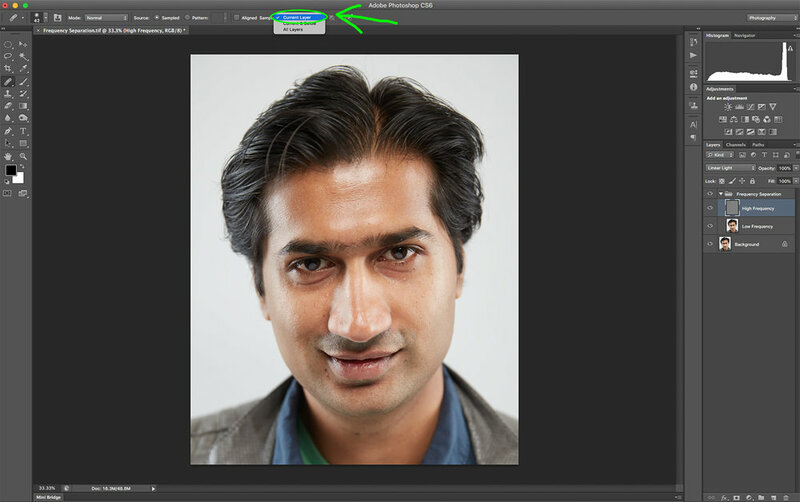 In Photoshop, go to Image > Mode and check how many bits/channel your photo has. Most photos have 8 bits/channel but yours may have more. Click on the appropriate action for your photo. 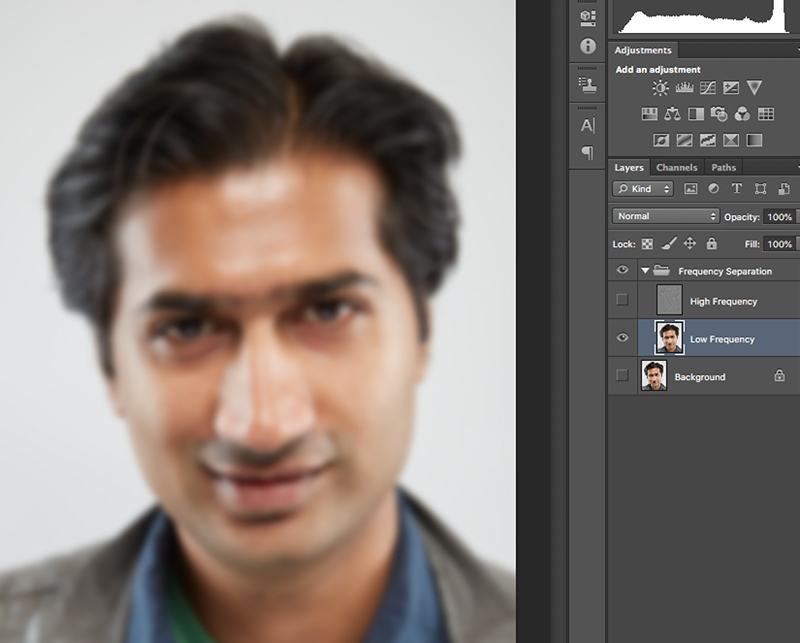 Before you start retouching, make sure both the healing brush and clone stamp tools are set to current layer. Use the healing brush on the High Frequency layer to remove any blemishes. You should do small areas at a time to avoid create a pattern in the texture. On the Low Frequency Layer, use the healing brush or clone stamp to blend uneven colors together. This will not affect any of the texture. 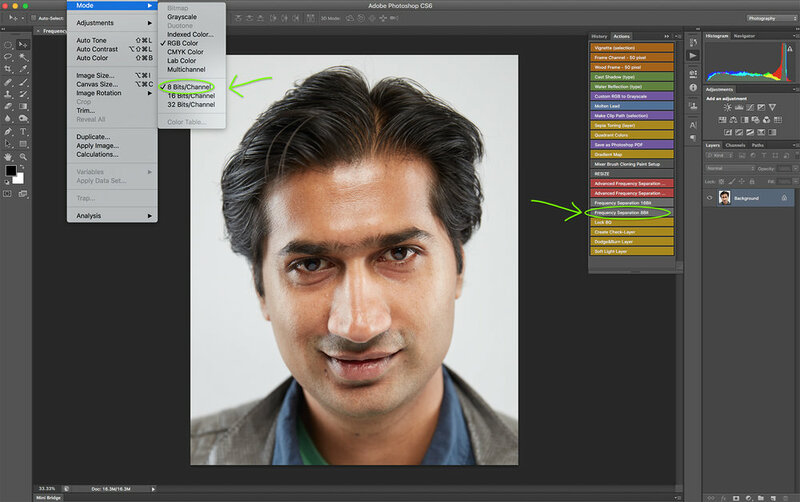 You can use other color correction tools, such as Selective Color, to further correct the colors. Here's the final retouched image after using frequency separation. It's really simple to use once you get the hang of it. I also did more color correction, sharpening, and dodge/burning. Check out this quick video I made of my whole process and see the power of frequency separation in action. If you want to learn more about retouching or photography, you can check out CreativeLive. They offer free classes live 24/7 or you can purchase older lessons. I've learned a lot from them about photography and lighting over the years and I'm sure they'll help you too. Thanks for reading!